In some Jewish circles, there is the tradition of baking a special type of challah for the first Shabbat after Passover. Made either in the shape of a key or with a key baked inside, the special bread is known as shlissel challah, with shlissel being the Yiddish word for "key." The custom is popular in communities that descend or have traditions coming from Poland, Germany, and Lithuania. The making of this particular shape or style of challah is considered by those who bake it to be a segula (ritual or good omen) for parnassa (livelihood). Why? There are many reasons, sources, and histories that highlight this uniquely-styled bread for Shabbat. There are those who bake their challah in the shape of a key, some who bake a challah and merely add on a piece of dough in the shape of a key, and then there is the tradition of baking a key into the challah. Still, there are others who actually bake their challah to look like the unleavened matzah (unleavened bread) that were just eaten on Passover. The key is added in to allude to the gates of heaven that are kept open from Passover to Passover Sheni, or Second Passover. Others will bake normal challah loaves and simply place sesame seeds in the shape of a key on top of the bread. During Passover, Jews read from Shir haShirim, the Song of Songs, which says, "Open for me, my sister, my beloved." The rabbis understood this as God asking for us to open up within ourselves a small hole, even as small as the tip of a needle, and in return, God would open a larger hole. 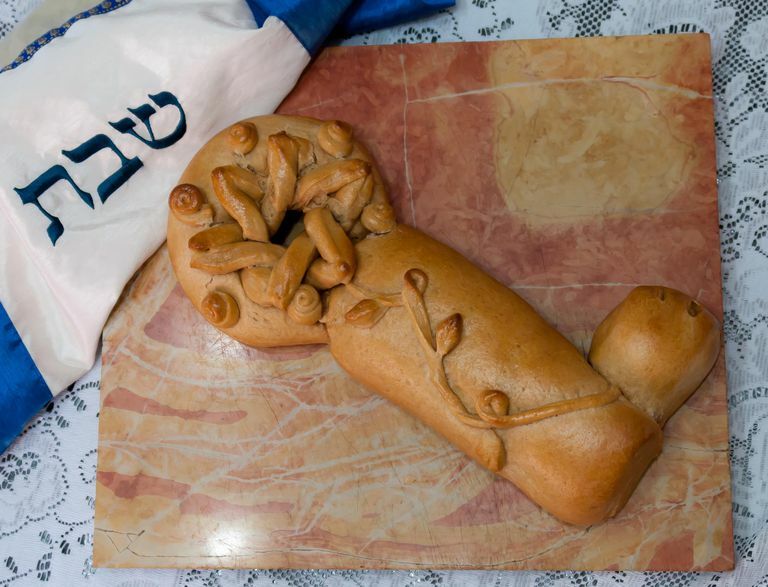 The key in the shlissel challah is an ode to Jews opening a small hole so God can fulfill his end of the bargain. On the second night of Passover, Jews begin counting the omer, which lasts 49 days and culminates with the holiday of Shavuot on the 50th day. In the mystical teachings of Kabbalah, there are 50 "gates" or levels of understanding, so as Jews go from day to day during the omer, each day/gate needs a key for access. During Passover, it is said that all of the upper gates of heaven are open and that after it ends, they are closed. In order to open them, Jews place a key in the challah. There is a concept in Judaism of yirat Shayamim or fear of heaven. On Passover, the matzah that Jews eat is meant to instill this fear of heaven. There is a teaching in Judaism where this fear is compared to a key, so Jews bake a key into their challah after Passover to show that they want this fear (which is a good thing) to stay with them even after the holiday ends. There are many traditions in the Christian world of baking keys into cakes and bread. In fact, some cite the origins of this tradition as being a pagan practice. One Irish source tells the story of men in communities under attack saying, "Let our women-folk be instructed in the art of baking cakes containing keys." At one time, keys were manufactured in the form of the cross in lands where Christianity was prominent. On Easter, Christians would bake a symbol of Jesus into their bread to symbolize Jesus "rising" from the dead. In these households, the symbol baked into bread was a key. The tradition of baking an object into bread are also found during the holiday of Mardi Gras in which a small baby "Jesus" is baked into what is known as a King Cake. In this instance, the person who gets the piece with the figurine wins a special prize.